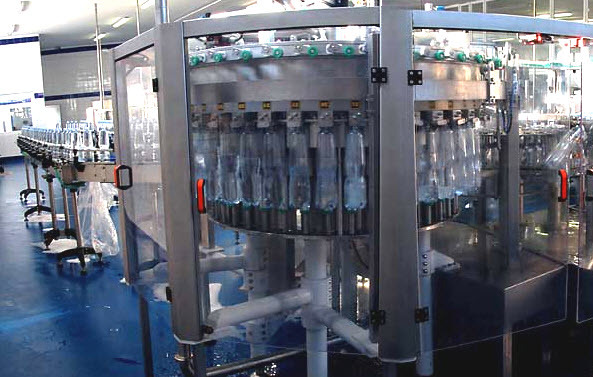 Packaging Air Conveyors - Canadian manufacturer of automation machines for the bottling and food industry. 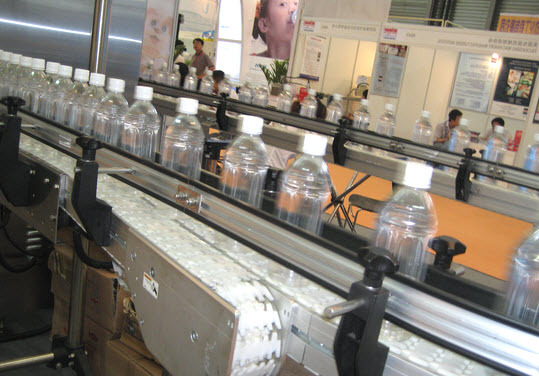 Design of custom machines conveying and filling empty bottles with unstable bases, soft bodies or fastened neck rings like plastic ketchup, peanut butter or energy drink recipients (models HDPE, PP, LDPE or PET, meaning 2-piece bottles). 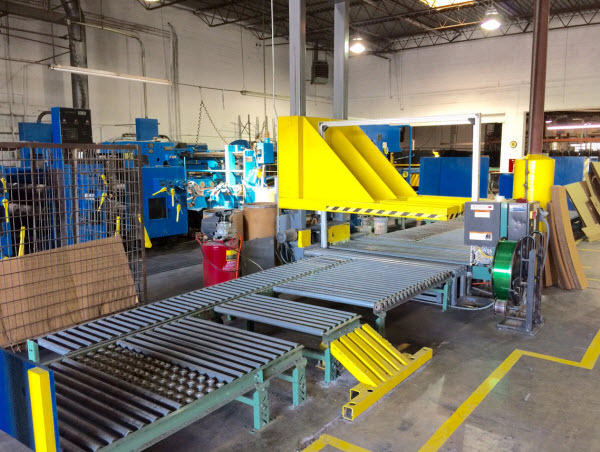 Our automation machines reduce down to 0.1% time the possibility of an air conveyor jam and accelerate the overall speed of the filling lines as well. The problem when packaging plastic bottles comes from the fact that the gravity point is too high (about 10% over the mid-part of the recipient) and that the weight of the cap excedes the weight of the molded base. So, instead of moving the items on a carpet, an uptight vertical conveyor is used in order to stabilize the product by the neck, which is using hat fixtures. The coefficient of friction (the actual resistance of the plastic material sliding along the fixed parts of the machine) is maintained low by the addition of a membrane made from polyethylene. Il attows to keep the brand-new look of the bottles by eliminating scratches all over their surface that could be produced by a frictional contact. At the end of the chain process, the hats grab the bottles and lift them to the delivery racks, getting them ready to be carried to the transportation decks. Why do we call them "air conveyors"? Because the bottles are not carried through a wheel mechanism but blowed by an air flow named "a louvered plenum" (meaning steady variations between high and low air pressure). Then, you can expect a high velocity speed over 5 meters/second of displacement by in the filling tunnel (or 18 kph). - Hepa filtration attached to the air conveyor : forces your factory to use an heavy-duty air filtration system to eliminate particles in the air. Otherwise, microscopic dust particles moving at high speend might damage your units as well as causing a malfunction to the machinery. D.G.G.R. Packaging And Crating - Providing full service packaging and shipping of military, overseas and commercial shipments. Complete line of packaging and shipping supplies and cardboard. Box grapic design for Eskaboard cardboard and paperboard. Our expanded distribution capabilities in 48h or less Canada-wide and fast manufacturing makes us the #1 custom cardboard manufacturer. 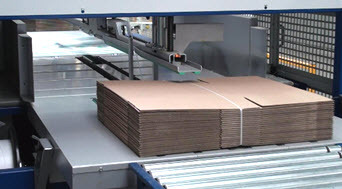 We start to process your carton chip, graphic and corrugated cardboard the same day. Supplier of Eska Cardboard for the moving boxes and packaging retailers. 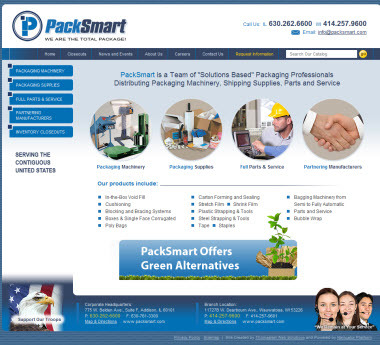 PACKAGING SYSTEMS FROM CREATIVE PACKAGING INC. Home | Creative Packaging Inc. brings you over 25 years of packaging experience! Visit our site! | Bagging Systems from CREATIVE PACKAGING INC.
UPPI is a custom thermoformer, and manufacturer of retail, medical, electronic and OEM packaging. We offer alternatives to foam and pulp protection. 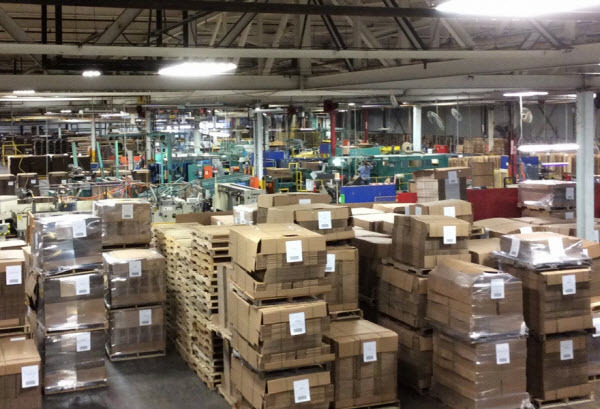 COR Packaging & Box Co.
COR Packaging & Box Co.: We offer one of the largest inventories of corrugated boxes and packaging materials in the industry. It's just one stop for all your packaging & shipping supplies. The Source for Packaging Solutions, Systems, Equipment, Supplies and Tools, Packaging Shred, Corner Protector, Block Fill Foam, Fp International, Foam Packing, Foam And Packaging, fill a void. Manufacturing, customizing, designing boxes, packaging, and software packaging for our customers - impact packaging, custom, boxes, tool, inserts, software, toys, san diego, california. Packaging supplies at discount prices, packaging supplies and machines including shrink wrap machines, shrink wrap supplies, stretch wrap, bag sealers, and more. 275 Industrial Boulevard Pulaski, Tennessee 38478 Phone: (931) 363-8625 Fax: (931) 363-8063 Where people make the difference At Valley Packaging, our people are our most valuable resource. *Note : All these listed websites were crawled by Web Data Extractor (version 5.0) or were directly submited by people through add url form.